Built in 1942, Norfolk & Western s Class Y6 locomotives were considered some of the best steam locomotives ever produced. Designed to haul heavy trains of coal from Appalachian coal fields, these articulated locomotives rank amongst the most powerful ever built. Able to the exert 166,000 lbs of starting tractive effort, two or three of these locomotives were often used to haul 175 car trains over the Appalachian Mountains. Norfolk & Western was rightly proud of their home-built machines and used them long after most railroads had converted to diesel. 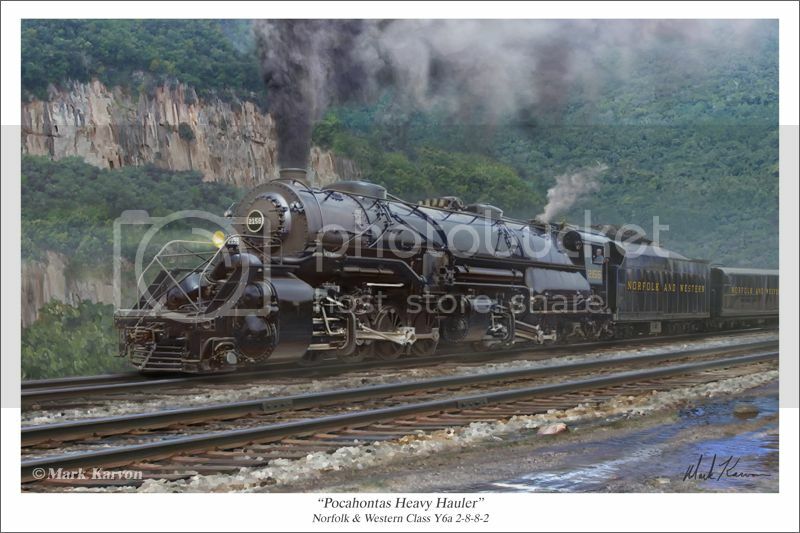 The subject of this print, #2156, was finally retired in 1959. She escaped the scrappers torch and is preserved at the Museum of Transportation in St. Louis, MO. Here she is shown at the head of a coal drag on the railroad's Pocahontas Division. Normally the fireman would not let the locomotive put out so much smoke. Knowing they are being filmed, I think they are putting on a good show. I like locomotives although I don't know much about them; I just like the idea of their size and power. I enjoyed looking at this painting and your background info brought greater appreciation of these machines. Thanks for sharing!